When it comes to the name BRP, you most often think of this manufacturer's popular Ski Doo and Sea Doo brands, but they also offer some of the most reliable and powerful all-terrain vehicles for tough terrains on land, as well as a complete lineup of motorcycles, with their Can Am lineup. When you need the best in Can Am parts for your favorite vehicle, we have you covered with all the best solutions in one convenient location. When the Can Am brand was introduced in 1972, it was originally a motorcycle lineup. With their on-road cruisers, the brand became a fan favorite for those looking for a sensible yet stylish bike while their off-roading options were an instant favorite for competitive riders and recreational use alike. While they would stay focused on motocross bikes for off-roading and competition for a few decades to great success, their all-terrain vehicles brought them to new territory in 1998. Since then, their models have held their own against the competition both on the market and in competitive racing arenas. 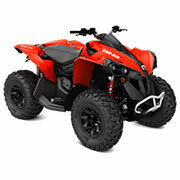 We are pleased to bring you a range of Can Am parts to meet the needs of your vehicle. With parts for all the top models and a wide range of years available, it has never been easier to find the right solution. Best of all, we offer OEM Can Am parts direct from the manufacturer to ensure the best in performance and fit for your particular model. Whether shopping for the Renegade or the Outlander, we have you covered with these high-quality Can Am parts. From crankcases and pistons to cylinder heads and fuel tanks, you are sure to find the right solutions with the diversity of the selection we offer here. Find it all right here and make sure your favorite vehicle runs at peak performance for years to come. We are committed to customer service from start to finish with every shopping experience. If you have any questions while shopping with us, please contact a member of our team for further assistance.